Hastings Online Times – Everyone can draw! That’s EVERYONE! Everyone can draw! That’s EVERYONE! If you have any doubts, come to Hastings Arts Forum on either Saturday or Sunday, 24-25 October and give it a try, writes HOT reporter John Cole. The Big Draw, the world’s biggest drawing festival, was initiated by Quentin Blake in 2000 and has since grown from 160 events in the UK to almost 1,500 worldwide. Big Draw events use drawing to connect people of all ages in new and enjoyable ways. The overriding principle of The Big Draw is that Everyone Can Draw! Hastings Arts Forum will be one of hundreds of venues throughout the UK where people of all ages and talents can come along to a fabulously fun day to draw, doodle, sketch, paint or just make marks with meaning. This year’s Arts Forum Big Draw theme will be ‘Every Drawing Tells A Story.’ People can use drawing to bring stories to life, reveal the past, capture the present and explore the future. 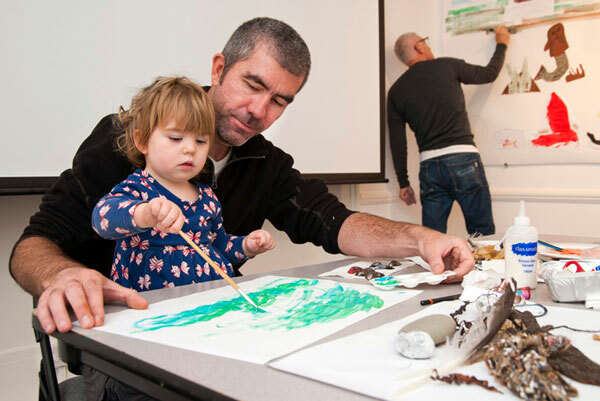 Professional artists – with Big Draw experience – will be on hand to encourage, help and inspire throughout the day and to assist you in creating your own original artwork, which will be on display in our Galleries for a week. All art materials will be provided on the day. All you need to bring is your enthusiasm and desire to have fun. And have I said this already? It’s FREE! Saturday and Sunday, 24-25 October 2015. Both days 10am to 4pm.